The year 1942 began badly for the Allies. German U-boats were indiscriminately sinking merchant shipping off America's east coast and in the Caribbean. Allied fortunes were no better in the Far East under the relentless Japanese advance. The year 1942 began badly for the Allies. German U-boats were indiscriminately sinking merchant shipping off America’s east coast and in the Caribbean. Allied fortunes were no better in the Far East under the relentless Japanese advance. America was struggling to hold the Philippines, while the Soviet Union was fighting a series of bitter winter battles against Hitler’s Wehrmacht at the gates of Moscow. General Erwin Rommel’s surprise offensive in North Africa brought a renewed threat to the Middle East in mid-1942, which hastened the transfer of U.S. aircraft to Egypt to assist the beleaguered British. The vast, sprawling deserts of North Africa were a new and strange terrain to American aircrew. Confronted by sand storms, flooding rains, extremes of temperature and primitive living conditions, the United States Army Air Forces were pitted against an experienced and determined enemy. U.S. air power nevertheless played a decisive role in the Allied invasion of Northwest Africa and the subsequent surrender of Axis forces in Tunisia in May 1943. Later bombing missions flown from North Africa struck Axis targets across Europe and supported the Allied invasions of Sicily and mainland Italy. 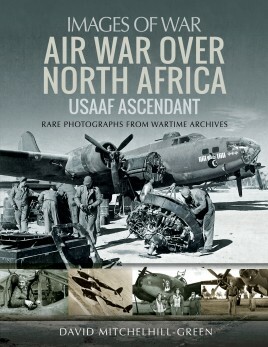 This book is a pictorial account of U.S. fighter aircraft and bombers — including the iconic B-17 Flying Fortress, P-38 Lightning and B-24 Liberator — and the aircrews that fought to establish ascendancy over North African skies and beyond.